Do you remember playing with paper dolls? Take time to play with them again in a different format and with an adorable teddy bear as the dress up doll this time. She has lots of lovely fashions and accessories to keep her on the well-dressed list. 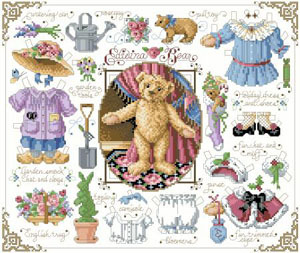 This adorable sampler by Sandy Orton is a delight of detail. Contents: Stitch Count 182w X 154h, Finished Size on 14ct 13" x 11"